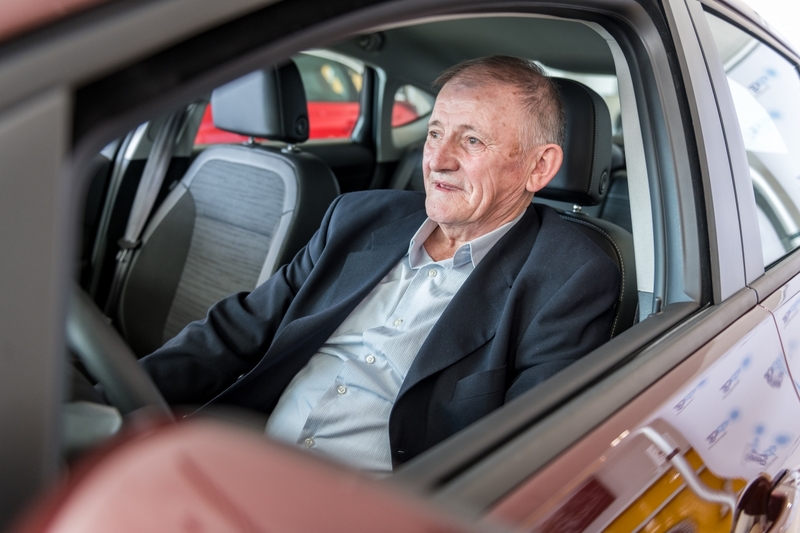 Dragić Vesković, a retired person from Berane, won OPEL ASTRA ENJOY. On the occasion of receiving keys to the car, he said that his family was delighted and that he would give the car to his son. He would continue to be member of the GOLDEN TEAM with higher motivation. Mr Vesković, who has been today given keys to the car by representatives of Elektroprivreda Crne Gore (EPCG), won the main prize of the first round of the prize contest GOLDEN TEAM – CATCH THE RYTHM. Mr Vesković said he could not at first believe that he had won the car; however, when he became aware that this was true he and his family became delighted. 'The surprise was tremendous and we wondered if that was possible. My family was happy and delighted. Our neighbours and friends were also happy and they said the car came to the right hands', said Mr Vesković. He said that he had been member of the GOLDEN TEAM for four to five years and that he had been paying electricity-related debt as soon as he would receive his pension. 'I pay our electricity consumption on a regular basis. As soon as I receive my pension I immediately pay my electricity bill. It is not me who would drive the car, I'm going to give it to my son. I will continue to be member of the GOLDEN TEAM, now I'm far more motivated', said Vesković. Dragan Kadić, the manager of the Customer Care in EPCG, congratulated to the winner and wished him to drive the car in happiness and for a long time. 'EPCG will continue to award households who settle their electricity consumption on a regular basis and who are members of the GOLDEN TEAM. The remaining 600 bill reductions worth €50 each will be given to members of the GOLDEN TEAM during the next four rounds. I would like to use this opportunity to invite all the members of the GOLDEN TEAM that still have not activated the service 'Electronic Bill' to do so, because their chances to win the prize would be higher in that way', said Kadić. The winners of the first round of the prize game GOLDEN TEAM – CATCH THE RYTHM, organized by Elektroprivreda Crne Gore, were drawn on February 20 in the Head Office of EPCG in Nikšić, in compliance with the Rules of the prize contest. There has been 193.444 households in the database, members of the GOLDEN TEAM. The prize fund for the first round is the car OPEL ASTRA ENJOY as well as 150 bill reductions worth €50 each. 110 bill reductions worth €50 were drawn from the database of the Golden Team members i.e. 193.444 members, and 40 bill reductions from the database the Golden Team members who use the service Electronic Bill i.e. 15.810 customers. 150 bill reductions worth €50 were won by households from different Montenegrin towns: Herceg Novi, Kotor, Tivat, Budva, Bar, Ulcinj, Cetinje, Nikšića, Žabljak, Mojkovca, Bijelo Polje, Rožaje, Podgorica, Berane, Pljevlja. Reductions worth €50 will be automatically calculated for them in the next February bill. The prize contest GOLDEN TEAM – CATCH THE RYTHM has started on January 15 and it would last until May 31. It will be carried out in five rounds. The prize contest was organized for members of the GOLDEN TEAM, i.e. for all the households that on January 31 owed €0 for their electricity consumption and thus became members of the Golden Team. We would like to remind that there have been four rounds of the prize contest left, and prize draw would be organized in EPCG Head Office in Nikšić at 09.45 h, according to the following schedule: the second round – March 20; the third round – April 17; the fourth round – May 27; the fifth round – June 19. During the next four rounds the prize fund will consist of 150 bill reductions worth €50 each. 110 bill reductions will be drawn from the database consisting entirely of the GOLDEN TEAM members, and 40 bill reductions from the database consisting of members of the Golden Team that have activated the service Electronic Bill.